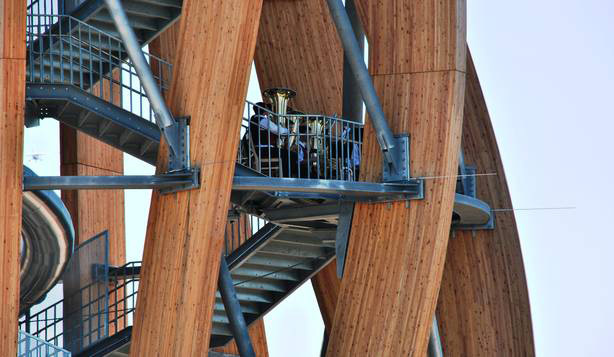 Pyramidenkogel, the world’s tallest timber observation tower. Timber construction is on the up; in Austria that’s literally, with developers in that country soon starting work on a building they say will be the world’s tallest commercial timber structure. Some of the developers’ compatriots in the timber building industry are expected to be star attractions at DesignBUILD expo in Sydney at the end of this month. 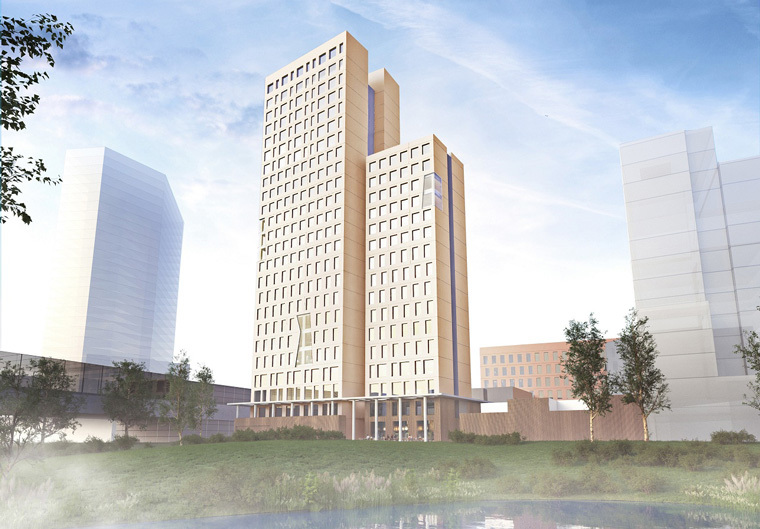 Developers in Vienna are about to start construction on what they say will be the world’s tallest timber commercial building, the 24-storey HoHo Vienna. The 84-metre hybrid-construction tower will use similar engineered timber materials to those imported from Austria by Lend Lease for the construction of Forté and Docklands library, both in Melbourne. Günter Kerbler, founder of the developer cetus Baudevelopment (part of the Kerbler Group), has personally invested about EUR 60 million into the project. The building, on a 4000 square metre site in Seestadt Aspern, a lakeside “smart city” urban development area, will have a gross floor area of 25,000 square metres, 19,500 sq m of net lettable area and a 3920 sq m building envelope footprint. Using wood to build to a height of over 80 metres was “a true challenge in terms of civil engineering and calls for most accurate planning, a creative team and just the right construction site”, Mr Kerbler said in a media statement. Managing director of cetus Baudevelopment Caroline Palfy said the developers had worked closely with architects from RL+P, structural engineer Richard Woschitz and fire protection engineer Alexander Kunz to recast the various methods of hybrid construction available in the market, keeping in mind the special demands that had to be met in terms of structural design, fire protection and efficient use. About 75 per cent of the building will be made of wood, starting from the ground floor. “HoHo Vienna can be considered a showcase project for wood construction in our day and age. There are two reasons for this: On the one hand, HoHo Vienna is the world’s first 24-storey high-rise made of wood that is due to be implemented shortly. On the other hand, the system, which we have deliberately kept simple, will enable us to build an efficient, highly versatile and safe building using hybrid construction with a considerable degree of sustainability,” Ms Palfy said. The building of taller timber structures, such as the HoHo Vienna, was facilitated by a change to Austria’s national building regulations in the 1990s. Multi-level structures constructed since include the eight-storey Lifecycle Tower (LCT 1) constructed in 2012 by Arup and Rhomburg, an Austrian architecture firm. 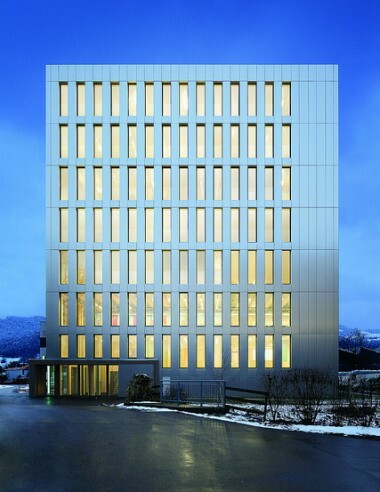 The commercial office building in Dornbirn has a central concrete lift and services core, and vertical structural posts of glulam with cross-laminated timber wall and ceiling panels. 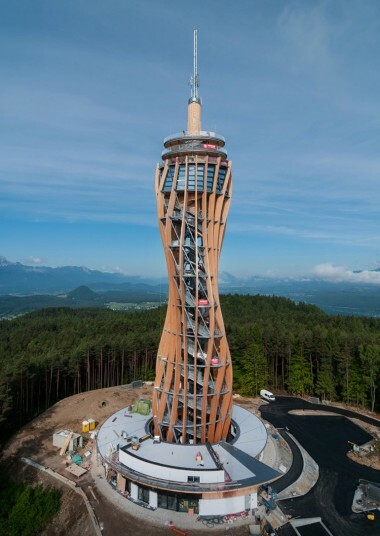 In 2012, the world’s tallest timber observation tower, the Pyramidenkogel tower in the town of Keutschach am See in Carinthia was completed. Designed by architects Klaura, Kaden + Partners, the tower is nearly 100 m tall, and comprises 16 glulam columns reinforced by 10 elliptical rings and 80 diagonal struts. In total, 500 cubic metres of glulam, 1000 sq m of CLT and 300 tonnes of steel were used in its construction. Unlike Australia’s large engineered timber projects, including Netball Central, Forté and Docklands library, the Austrian project will be able to use locally manufactured engineered timber products. According to Sydney-based Austrian consul general and trade commissioner Guido Stock, the nation has historically had a tradition of using timber for construction, with a strong focus on sustainability throughout the materials’ lifecycle. He said forests were one of the only major natural resources the nation had, as it is a small land-locked country, steeply mountainous with few minerals resources. Manufacturing accounts for about 20 per cent of the nation’s GDP, and among its key outputs are value-added timber products including MDF, fibre-boards, windows, roofs, parquet flooring and prefabricated housing. 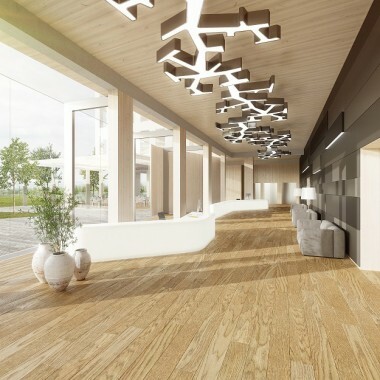 In the past 10 years or so there has been a revolution in the sector with new products such as CLT, laminated veneer lumber and Glulam being developed. These products contain “a lot of know-how” acquired from other forms of engineering and value-adding, Mr Stock said. While the timber products sector had not been supported by specific innovation policies on the part of Austria’s government, it has had the raw material base protected by forest policies that have been in place since the 1800s. These policies focus not only on the supply of timber for building and the generation of electricity and heating, but also include protecting the wider co-benefits provided by the forest estate. Austria had a long tradition of cultivating forests, which have historically been a key resource for building material and as a heating material, Mr Stock said. The nation’s forestry regulations originated in the mid-1800s when Emperor Franz Josef the First of the Austro-Hungarian Empire decreed Imperial patent regulations to cover uses of forests. This structure remained in place until the 1975 Forest Act updated practices to reflect modern standards. “The Act is based on principles of improvement of protective, welfare and recreational effects of our forests,” Mr Stock said. As part of this approach, the size of the forest estate continually increases through reforestation and active cultivation of woodlands. It is estimated that around 50 per cent of the country’s land is currently forested. According to Mr Stock more than 50 per cent of forests are certified under the international Program for Endorsement of Forest Certification scheme, and about 5000 hectares of the nation’s forests carry Forest Stewardship Council certification. The upkeep of forests is regarded as critical for wellbeing in terms of co-benefits they provide, including protection from erosion, landslides and avalanche risks in steep landscape areas, and also for maintaining water quality. Mr Stocks said all of the nation’s lakes and streams have potable water quality, and this is attributed to the maintenance of forests in the catchments. Sustainability is a driving imperative generally, with energy, water and resource efficiency a strong focus across both industry and the general community. The steep terrain and numerous waterways enable the country to generate 39 per cent of its electricity from hydroelectric projects, and this in combination with the emphasis on biomass gives it a low national carbon footprint for energy generation. Timber waste is used to generate both heat and electricity, with numerous small communities powered entirely by bio-energy. The capital city, Vienna, also has a large plant that generates power and heating from wood waste. According to Mr Stock green is a “conviction” in Austria. There was also a shift away from the use of chemicals of concern such as formaldehyde in value-added timber products, driven by community concerns about their health effects and also potential contamination of water supplies. Mr Stock said all Austrian manufacturers are using formaldehyde-free adhesives and finishes.